Hennen Furniture: Is It Time To Update Your Flooring? Is It Time To Update Your Flooring? It’s sometimes easy to forget what’s right under your feet. The truth is even with proper care, your home’s flooring will begin to show wear over time and that can make even new furniture appear dull. A new shade of carpet, hardwood floor, or area rug can help accent your furniture and bring a fresh sense of style to your home. There are many different types of flooring available for every style and budget. If you’re ready for a change, take a look at these different flooring options and imagine the possibilities. Traditional wall-to-wall carpet is the tried and true preferred choice for many homeowners. Carpet is easy to care for and feels cozy under bare feet. With endless colors and patterns to choose from, carpet looks great in any home and with any style of furniture. For homeowners looking for a good neutral carpet color, consider choosing gray or taupe. Both of these colors come in a variety of shades and are currently trending along with blues and greens. Carpets with geometric or textured patterns are also very popular. From dark woods to white wash, the classic look of hardwood never goes out of style. Hardwood floors are durable, easy to keep clean and are a beautiful addition to most any room in your home. To keep your hardwood floors looking their best, floors should be kept dry and care taken to avoid scratches. Real wood floors are not suitable for bathrooms. Vintage hardwood, as well as distressed or reclaimed wood floors, gives your home a rustic feel. When choosing your wood floor, consider the width of the planks as well as the color or type of wood. Wide plank wood floors are growing in popularity and can add drama to your decor. Tile always looks great in the bathroom, but why stop there? Glazed tile is durable, stain resistant and can be a gorgeous upgrade to other rooms in your home. Choose from a variety of color and pattern options for your kitchen, entryway, or even your dining or living room. And, speaking of bathrooms, consider bright or bold tile designs to add a pop of color to small bathrooms without overwhelming your guests. Like carpet, vinyl is also a first choice for many homeowners looking to add style and color to their home. Vinyl flooring is scratch and stain resistant and can offer the look of wood or tile without the added expense. Area rugs make a great focal point for any room. When searching for an area rug, think large loop, soft, or even fluffy for the perfect balance to your hardwood or tile floors. At Hennen’s Furniture in St. Cloud, our huge flooring showroom offers the area’s best selection of carpet, wood, vinyl, tile, laminate and area rugs with many colors and styles to choose from. Our experienced design experts can answer your questions and help you select from our many top quality brands. 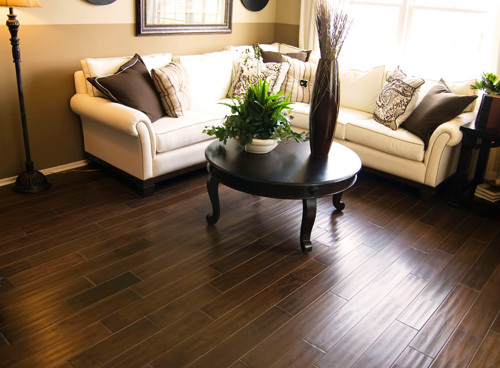 We offer Armstrong, Shaw Floors, Mohawk Flooring, Florida Tile and many other popular brands. And with Hennen’s superb customer service, you can rest assured we’ll stay with you right on through your installation. At Hennen’s, we make updating your home affordable with special financing, so you can get the look you love. Come see us today!